Stylist Brian Hawkins has long been a member of the SEVEN family, using our products in his editorial work and backstage at Fashion Week. 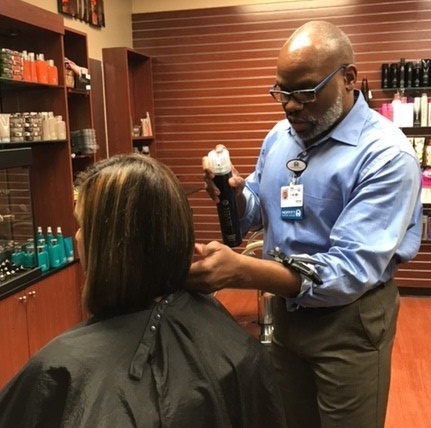 When we heard Brian had taken on a new role as the salon supervisor of Magnolia’s Salon at the Moffitt Cancer Center in Tampa, FL, we wanted to know more. Read on for his story. Why did you get involved with Moffitt Cancer Center? Honestly, this opportunity came to me by surprise, but it spoke to me personally because my dad is living with cancer, and I’ve lost family members and close friends to cancer as well. I had just established myself in Ft. Lauderdale, Florida which is 4 hours north of Tampa. A friend forwarded me the job posting for the Salon Supervisor position and encouraged me to apply. I decided to apply because I am a firm believer in ‘everything happens for a reason,’ and ‘what is meant to be will.’ Literally, the next day I had a phone interview with HR, a day later my first interview, and then my second interview two days after that. The position was offered to me the following week with an immediate start date. I took it as a sign and that this where I’m supposed to be. Do any stories in particular come to mind? There was a husband and wife that came in. The husband was just starting treatment and needed his head shaved and you could tell he was having a hard time with it. When I was done, his wife sat in my chair and looked at me and said if you don’t do it I will. This is my husband and I support him in everything we do. He looked at her like what are you doing?! And she looked at me and said please go ahead. He sat next to her and held her hand and they cried. It’s those things that keeps it in perspective to me. My career is amazing on so many levels: salon ownership, editorial work, celebrity clients, TV and film, brand ambassador and educator, and lead at Fashion Week, but for me, THIS is why it’s called the beauty industry. The talent and gift that we have as stylists is to empower everyone we come into contact with. That gift and talent should not only be about or limited to just cute/trendy haircuts and/or color, but truly to empower the person through our talent of touch and our gift of compassion. Therefore, it is meant for me to expand my gift and talent to those who truly need empowering as they go through their journey with cancer. Can you explain why the beauty industry means giving back to you? It started a few years ago when I started volunteering at men’s shelters. For a man to feel confident enough to go out and apply for a job or reconcile with their spouse because I was able to provide them with something I consider a life necessity is really important. I would talk to other stylists about doing this and they would respond with, “why would I do this for free?” You mean to tell me to give a haircut to someone at no cost to help change their life has no value to you? It’s about helping to empower others. If you’re only in it to play with fun colors or do crazy cuts, you’re not in it for the right reason. We have a power to help someone with our talents. With women, it’s a harsh reality when you lose your hair. We also provide makeup services to fill in brows that may be lost, or lashes. It’s not just the hair on the head. We want to keep them as empowered as possible. How do you bring some of your editorial and fashion work to these clients? I bring my knowledge of what to expect in the journey of hair loss as well as regrowth for their scalp and hair. When consulting with someone seeking a wig, I assist in finding what works best for their needs. I think some people don’t understand that I am working with patients who are seeking a wig as a necessity and not an accessory. It is a different vibe and understanding with each person. It’s genuine. What my team and I do here is important because it truly is a service that patients need and there is a comfort of being able to come to us where they are already receiving treatment. They receive more understanding, patience, and encouragement with us. What is fulfilling yet ironic is when a patient says ‘thank you’ to myself and my team. If anything, I am thankful for them. I gain new perspective every day. No matter what I think or feel is wrong, or if I’m having a bad day, it is nothing compared to what the patients are fighting for, which is something so simple that we take for granted–life. Has SEVEN been helpful and supportive of what you do? Completely! 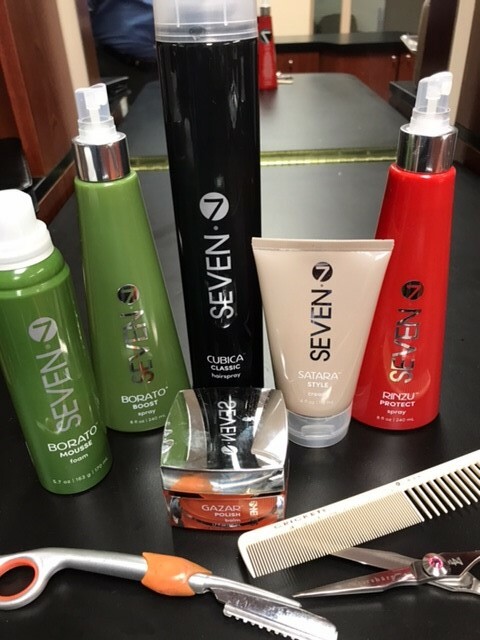 That is why I wanted SEVEN to be a featured brand for the salon. Since I first started using SEVEN a couple of years ago, I’ve found that not only is the product great, but the support that the team provides is wonderful. I even received items from SEVEN to use for a raffle gift in support of Breast Cancer Awareness Month. How can companies and individuals support what you do? Simply give back where you are locally. As stylists and artists, don’t be consumed with what happens in your salons or with shows, editorials, etc. Remember that there is a community outside of the salon that is deserving of your talent at no cost just as much as the clients that pay you. Volunteer your time at your local shelters, offer a day of free haircuts at your salon, visit a cancer center or hospital in your area and give of your time to someone who is too ill to wash or simply comb their own hair. If you don’t understand that, then you are in the industry for the wrong reason. Do you have a favorite SEVEN haircare cocktail that you use on your clients? 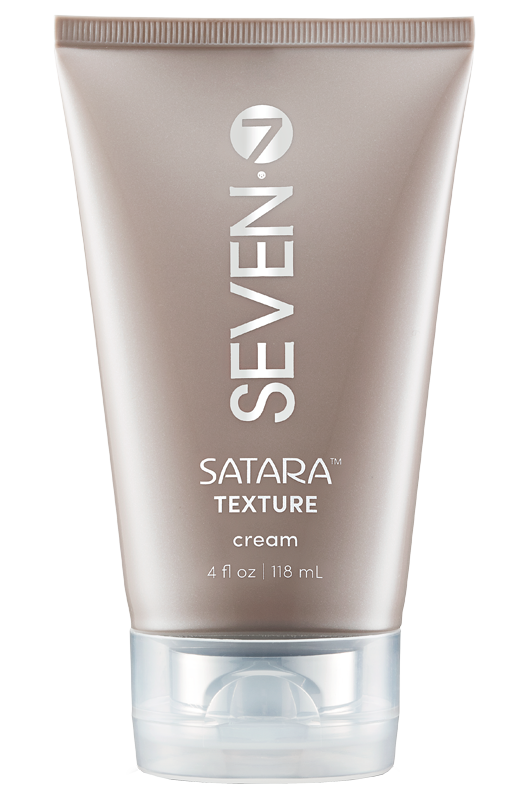 For those experiencing hair growth, I usually go to the SATARA TEXTURE cream. 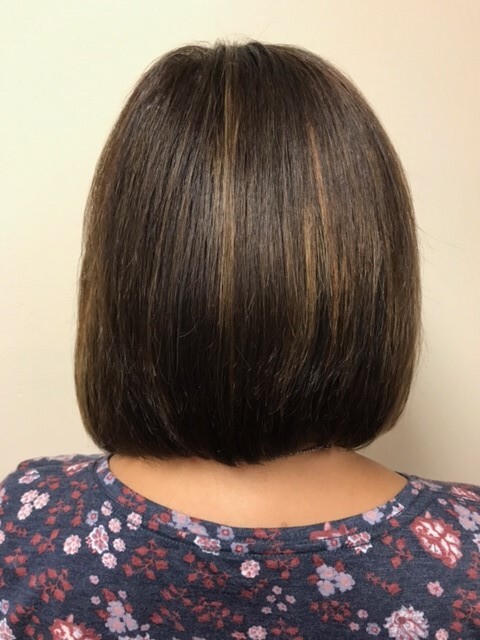 When hair grows back post cancer treatment, it grows back a thicker and coarser texture because of all of the chemicals the body is trying to release through the scalp. TEXTURE cream works best to soften and control the hair better when it’s at the shorter length.